Medicare Premiums - Can You Control? Medicare Premiums - Do you have any control over amounts? Medicare B and D premiums are based on the income you reported on your most recent tax return - sounds simple enough but there’s a couple of things you may not know. The “most recent tax return” rule is intended to be from Social Security’s viewpoint, not from your viewpoint nor the Internal Revenue’s database. The process of Social Security verifying income takes additional time. Therefore, 2017 Medicare premiums are based on your 2015 tax return. Your 2018 premium will be based on 2016 tax return, your 2019 premium based on 2017 tax return, and so on. Medicare beneficiaries not receiving Social Security benefits. High-income earners - charged standard premium plus surcharge (see below). More than 70% of all Medicare beneficiaries fall under the “hold harmless” provision. This provision is tied to the same Cost of Living Adjustments (COLA) that apply to Social Security benefits. The rule states that Medicare B premiums cannot increase year to year by an amount larger than the COLA adjustment given to social security recipients. Different standard premium amounts and hold-harmless limits are main reasons why some people pay lower premiums than others may pay. Those with higher incomes may also pay higher premiums (see below). 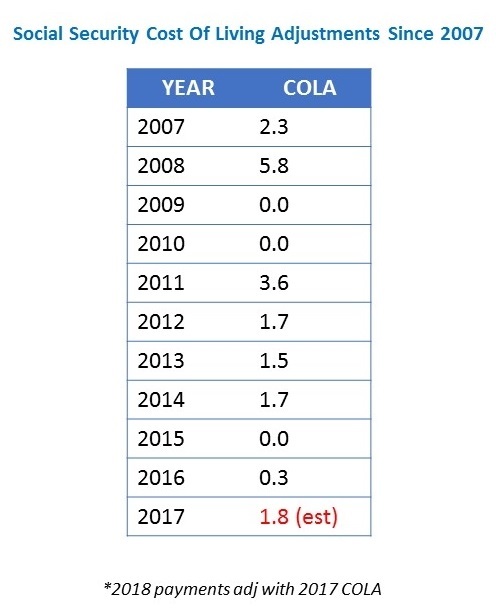 The projected COLA for 2018 is expected to be 1.8% - only exceeded twice in last ten years (see chart). Even though the standard premium of $134 is expected to be the same in 2018, many people under the hold harmless provision may experience increased premiums up to a maximum of $134 (if under high-income thresholds). For example, assume Joe, age 67, enrolled in Medicare when he turned 65 in 2016. His premium for 2016 was $104. In 2017, the standard premium increased to $134, but since the COLA adjustment for Social Security benefits was a meager 0.3%, his Medicare premium was limited to an increase of $5, making his Medicare B premium $109. Assume Joe’s monthly Social Security benefit for 2017 is $2,000 per month. If 2018’s COLA adjustment is 1.8%, Joe’s monthly benefit will increase by $36 to $2,036. Since Joe is currently paying $25 less than the standard premium amount ($134 less $109), his premium will increase $25 (not the full $36) in 2018 to $134. 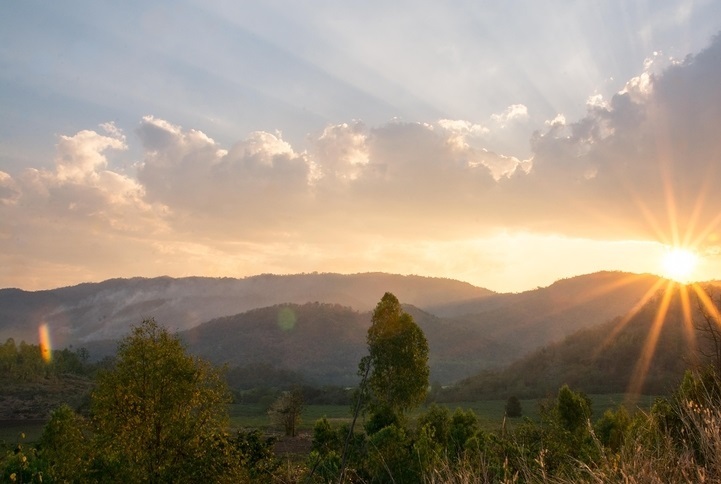 One of the major changes in 2018 is expected to be the “condensing” of the top three income brackets. The premium that will apply to this larger group has not been disclosed yet, but if the income thresholds remain unchanged, as they’re expected to, anyone making over $107,000 if filing an individual tax return, or $214,000 for joint filings will be subject to the new premium. Since Medicare premiums are based on income reported on your tax return, it could possibly make sense for future retirees to diversify their retirement income sources since each source may require different tax treatment. For instance, certain income is not part of modified adjusted gross income including: Roth IRA or HSA distributions, return of principal on investments, or proceeds from reverse mortgages. At Carr Wealth Management, LLC, we specialize in delivering a knowledge-driven service to help our clients pursue their goals. There is no product that can help people make the right decision with planning for Medicare premiums or help selecting the optimal Social Security claiming strategy. Let us help you make better informed financial decisions for you and your family. Contact us for a no-charge consultation or if you simply have a question about this topic or related financial planning areas.